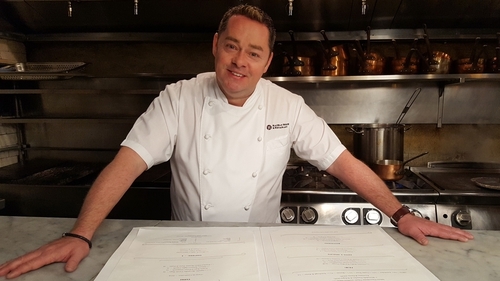 After a memorable trip through Italy, Neven Maguire is back with another series of Neven’s Irish Food Trails. This time he travels to counties Cavan, Limerick, Dublin, Meath, Wicklow, Wexford, Cork, Kerry, Carlow, Waterford and Kilkenny; and visits some of the country’s most innovative and exciting food producers and chefs including a snail breeder, Dublin’s top patisserie, a seaweed forager, a mozzarella producer, and a 5th generation miller.Chefs include Michael Tweedie from Limerick’s beautiful Adare Manor, John Wyer from Forest Avenue in Ballsbridge, and Sunil Ghai from Dublin’s Pickle restaurant.And as always, Neven cooks some of his own popular recipes. Programme one: In the first episode of his new series, Neven explores the internationally renowned Irish dairy industry. His first stop is Ballynoe in county Cork where he meets Maeve O’Keefe, one of Ireland’s youngest dairy farmers. Maeve shows Neven her herd of Jersey crossbred cattle, discusses her passion for farming, and the unique challenges of being a female farmer. Maeve a member of the Bord Bia Sustainable Beef and Lamb Assurance Scheme Staying in Cork Neven calls in at Kerrygold Park, Mitchelstown, where he takes a behind-the-scenes tour to discover how this world famous Irish food product is made. Irish butter is an essential ingredient at Neven’s next stop, Le Pattisier in Dublin where leading pastry chef Robert Bullock creates handmade patisserie desserts. Robert shows Neven how to make a classic French pastry – Tarte Au Citron Meringue. An innovative and unusual Irish dairy product, inspired by traditional Italian recipes is Toons Bridge Mozzarella. Neven ventures back down to Cork to Toons Bridge, near Macroom, and learns how Italian cheesemaking techniques are combined with local milk to create Irish mozzarella. At home in Blacklion in Cavan, Neven devises a recipe influenced by his trip: Mozzarella Balls with Smoked Tomato Sauce. Always look for the Bord Bia Quality Mark on food so that you know it has been produced to the highest Bord Bia quality standards and where it comes from. That means you can relax and enjoy it more.